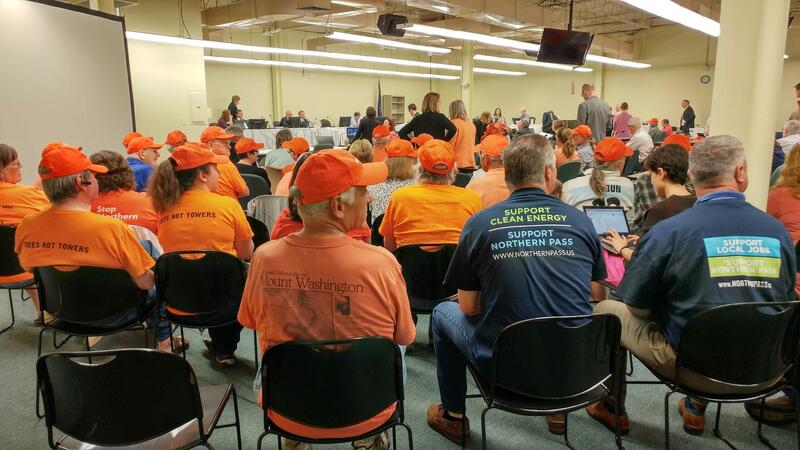 Orange-shirted opponents of Northern Pass sit with blue-shirted supporters at the Site Evaluation Committee Thursday. Eversource has argued the state Site Evaluation Committee didn’t consider enough details about the power line proposal before denying its final permit earlier this year. 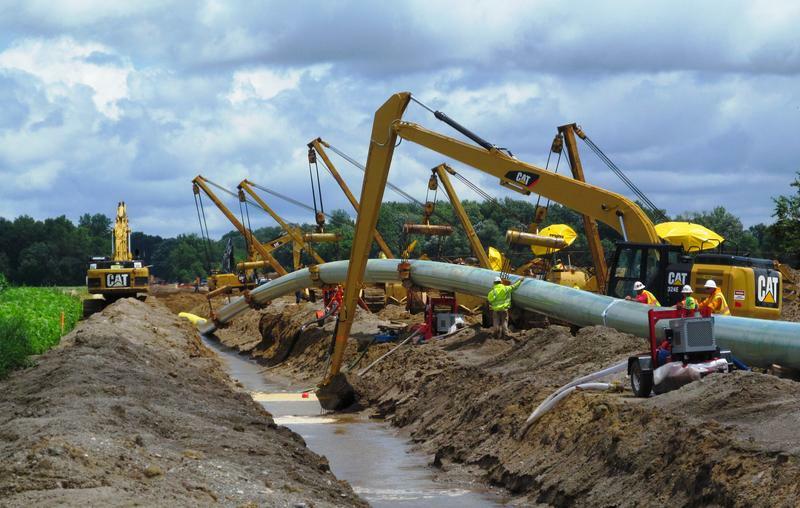 The utility wants to build the nearly 200-mile, partly buried transmission line from Quebec through the White Mountains into central New Hampshire. It would bring about 1,100 megawatts of hydroelectric power onto the New England grid. SEC chair Martin Honigberg and his colleagues said Thursday they feel they did their legal due diligence before rejecting Northern Pass. “I think if we had viewed this project as a winner, for a variety of reasons, it would have been approved,” Honigberg said. The committee also voted against having two members recuse themselves from future proceedings on the project. Business groups supporting Northern Pass had argued those members made biased statements. Eversource spokesman Martin Murray says the utility doesn't take the prospect of a Supreme Court appeal lightly. "We only do it when we have confidence and conviction that we can carry the day,” he says. “I think you can expect we will go to the Supreme Court in this case." The court could either uphold the SEC's denial of the project, or tell them to reconsider it. In that case, Murray says, Northern Pass would return to the SEC – “perhaps with a somewhat revised application, perhaps with a revised committee membership, given the time lag." The only other energy project the SEC has ever rejected, Antrim Wind, has been in appeals before the state Supreme Court since last year. But Murray says they feel Northern Pass has a strong case. He says they’ll seek to prove to the Supreme Court that the SEC erred in its legal handling of the proposal. He says they’re encouraged by a recent Supreme Court ruling that says utility regulators misinterpreted state policy restructuring New Hampshire’s electric system. Murray argues the Public Utilities Commission applied that misinterpretation in denying part of the Northern Pass plan in 2016. Meanwhile, Northern Pass’s federal permits are facing a new legal challenge from a different direction. New York-based Allco Renewable Energy is suing the U.S. Forest Service for giving Northern Pass permission to build in the White Mountains. The suit, filed Thursday, seeks to overturn those federal permits. 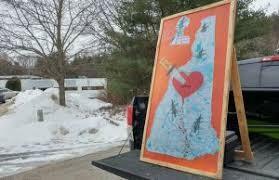 A sign opposing Northern Pass depicts the project as a knife through the heart of New Hampshire in the White Mountain National Forest. It argues the Forest Service didn't conduct enough required analysis of alternate routes and climate change impacts before green-lighting Northern Pass. Allco president Thomas Melone says they’ve filed smaller lawsuits on similar issues in other states before, to help smaller power companies like themselves compete. "If you need to get this amount of renewable energy, is this the best way to do it, to cut through the forest?” he says. “Or is there another way to do it, which would be getting a whole bunch of solar and wind projects from other developers that don’t cause you to cut through the White Mountain forest?" Melone says his company submitted one bid, for a 20 megawatt solar farm, to Massachusetts’ request for 1200 megawatts’ worth of renewable projects. The Bay State initially offered the contract for that entire request to Northern Pass. When Eversource hit a stumbling block in New Hampshire, Massachusetts regulators switched to a similar-size hydroelectric transmission line in Maine. Melone says it’s bad for the environment and renewable energy jobs around the country for states to limit realistic development opportunities to only the largest companies. Eversource says it may intervene in the Allco suit at a later date.